It’s here again: Multihulls World’s now traditional, but no less keenly awaited ‘2015 Buyer’s Guide’. For around twenty years now, this annual guide has become the essential tool for finding out all about multihull production throughout the world. It is the database which must be consulted to choose your multihull, giving you full knowledge of the facts, whether for racing, cruising or sailing round the world! In these pages, you will find all the year’s new boats, and those to come in 2015, as well as those already announced for... 2016! But it would be incomplete if we didn’t also include the best of the world’s existing multihull production. This compilation of information is sizeable, as this year almost 1,300 files have been updated by our journalists. Files accompanied by photos and videos which you can consult in full and free of charge on our web site, www.multihulls-world.com. The Paris Boat Show, conscious of the importance that multihulls have gained for today's sailors, has decided to turn the spotlight on our favorite boats this year. Multihulls will therefore find themselves right in the middle of hall 1 at the Paris show, and the organizers have asked us to prepare a marked circuit through the show’s various halls, for visitors interested in catamarans and trimarans. You can now find the details of this route on the Multihulls World or Le Nautic web sites, or come and see us on the Multihulls World stand at Paris (Hall 1 Stand G41 from 6th to 14th December). 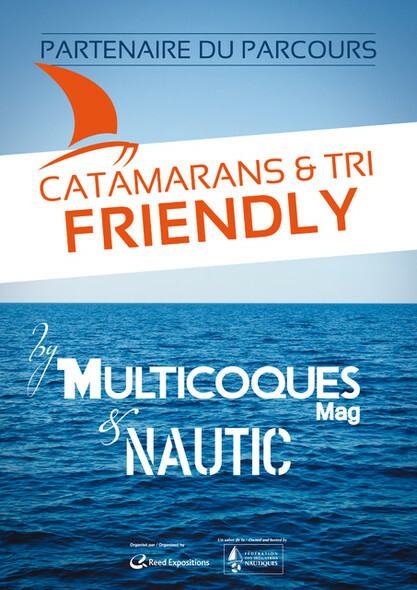 We will be delighted to offer you the paper version of the ‘Leaving in a Catamaran’ route, to help you get your bearings at the Paris Boat Show and easily find our ‘Catamaran and Trimaran Friendly’ partners.